I can't believe it's been so long since I last blogged. My attempt at doing this regularly fell by the wayside when life got super busy. The last 6 weeks have been so full of emotions that my head is spinning just thinking of them. One of these days I will blog about it, but I just need to time be with my thoughts and process. So while I process how about a little share of backyard wildlife? June has not been the best weather month in Northern Virginia this year. Between rain, and heat & humidity that is usually reserved for late summer, it's not been a little brutal. Add to the mix David having surgery and we have not ventured anywhere to enjoy some wildlife photography. In my attempt to turn lemons in to lemonade, I have been trying to remind myself of how much I love the local wildlife that visits my back yard. Birds, bunnies, lizards, turtles, ground hogs, and squirrels! 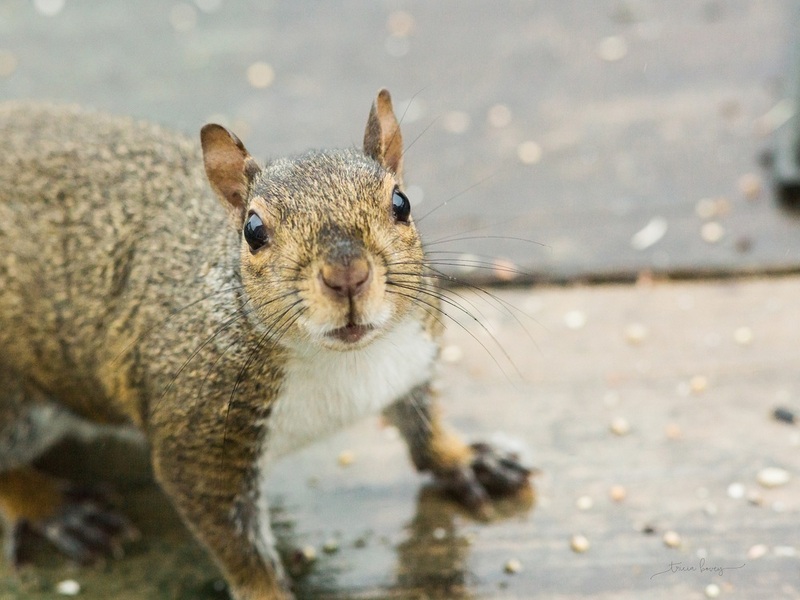 I know many people view squirrels as pesky tree rats that steal the seeds they leave out for birds, but quite honestly I love them. We don't have tons of squirrels running around, so I really get excited when one visits my deck and partakes in some of seeds and nuts that I've left out. I love watching their little paws bring the food up to their mouths and some of the looks you get out squirrels are pretty funny. I've been slowly trying to gain a little trust from the two squirrels that frequent my deck Don't worry, I have no plans on trying to domesticate my wild little buddies, I just want to be able to photograph them through a cracked sliding door instead of a dirty window. I think we made a little progress this week. I don't have any super cool animal photos to share this week, but I hope you enjoy the pics of my little squirrel friend. When David and I bought our first DSLR's, I had no idea how much our new hobby would change my perception of the world. It's hard to admit, but the simple fact is that until I had this amazing tool that helped me see the world differently, I was pretty apathetic to things like climate change, trophy hunting, environmentally safe products, and so much more. While I’m far from perfect in making sure my footprint on this beautiful planet we live on is as small as possible, I have made significant strides in trying to be a responsible citizen of this earth. In honor of Earth Day, and as a reminder of why these continued changes are important, a little look back on some of my favorite wildlife and landscape images from the last year. Changes, however small they can be, are hard. But even a small change that reduces your environmental footprint will have an impact, for the good, in the long run.